I've recently devoured a book by New Zealander Janet Luke. It thought I knew quite a lot about Green Urban Living, or gurbing, as she calls it, but now I know a lot more! they leave a feather on it. I have some new projects to try as a result. 1. 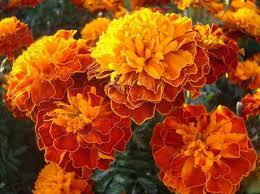 These flowers are a certain type of marigold, Tagetes patula. Janet and Good magazine have reminded me what a fabulous companion plant they are. A new order from Kings Seeds is imminent. 2. Comfrey. This herb, while not beautiful and a bit invasive, is something I've also meant to get for ages. I couldn't find it in the Kings Seeds catalogue, but I'm now determined to try a garden centre. It has a deep tap root and pulls up nutrients from well below the surface. Then you tear leaves off it, use them as mulch, in compost, to feed chickens and to make liquid fertiliser. 3. A compost tower, which she calls a Harvest Highrise, in the garden. It's a tall tube of wire mesh - although I'll probably use plastic because we have some spare - with a PVC pipe down the middle, held in place by layers of material to compost (I wouldn't use kitchen scraps here, I don't think, because there's nothing to keep rodents out). The idea is that you grow plants up the outside of the wire mesh, and as the compost inside breaks down it feeds them, plus the heat generated by the degradation provides extra warmth to the plants. The PVC pipe is bunged up at the bottom end by an old bottle, and the pipe has holes in it. You pour water down the top of the pipe both to keep the compost moist and water your plants. It sounds intelligent to me and I'm definitely going to give it a try. 4. Buried clay pots. Because water seeps through the walls of clay pots, you can bury them next to plants with the top opening of the pot above the soil. Keep the pot filled with water, and the plants will be constantly watered. (The opening at the top needs to be covered with an old plate or something to keep mosquitoes away). 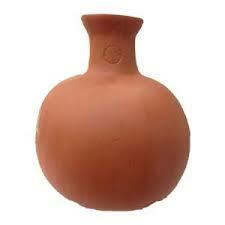 This is apparently a very old North African/Spanish method of irrigation, and the proper pot to use is an olla. I don't think they're available that shape in New Zealand though. Terracotta pots are cheap at garden centres and will have to suffice. You can feed the plants at the same time by filling the pots with worm juice from a worm farm, or liquid fertiliser. She also recommends throwing absolutely all your kitchen scraps into the chicken coop and leaving them there so they can form on-site compost. But of course chickens don't eat everything, and the idea of rotting citrus, onion, vege peelings and goodness knows what else lying around the coop speaks to me of smells, mould, flies and rats. On another page she does say to remove any uneaten scraps at night to avoid rats, so I'm not sure how these two approaches go together. Maybe I'm missing something. She has a nifty design for a movable coop, which does look great except that its frame is made of PVC pipe. Plastic + sun = brittle, breaking plastic that's only good for the dump. If you had a supply of second hand pipes it would be okay, I suppose. But pay little heed to me! The book is brilliant, I applaud her for writing it, and apart from these small concerns I thoroughly recommend it. You can get it on her website. She has two other books, both of which I would love to read. One is about how her family lived self sufficiently off their own urban garden for four months by farming small goats, snails and rabbits! What a woman. Around these parts, my budget glass house, comprised of a scavenged sheet of perspex leaning against a window, is doing good things for my seeds. Zucchini, sunflowers, spinach, coriander and tomatoes are rearing their green heads. I have some heat-loving capsicum and cucumber seeds sown in pots that I bring inside every night, and two of the cucumbers have sprouted. And today I collected my biggest ever egg harvest. Five hens, and five eggs. The last one laid for the first time today, having been sick with sour crop. I feared for her life, but she recovered, and just yesterday I noticed her comb had turned bright red. Today came that precious first egg. Thank you, I said. I hope I'm not boring you with garden posts. I can't seem to get enough of it, and Janet Luke has only fed my fire! Hi Madeleine - yes of course, now I think about it Janet wrote to get the type that doesn't seed. Therefore it was a bit dim of me to look in a seed catalogue for it! Loving the garden posts. Don't stop. 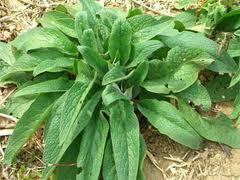 My neighbour has miles of comfrey growing. Can probably get some for you. Give me a ring.